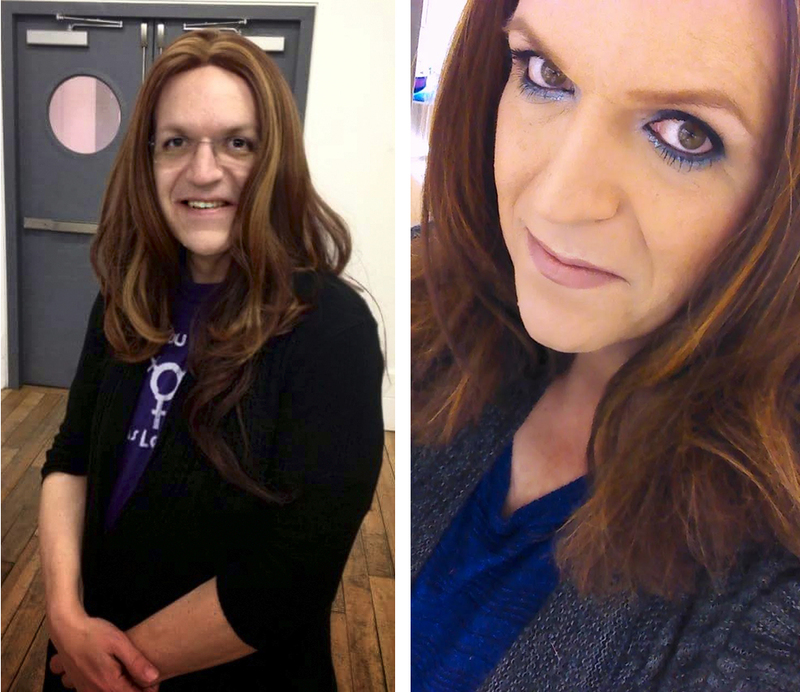 I am a transgender woman in my 50s. I was born and raised in Toronto and make the downtown core my home. I’m coming up on the end of my first year in transition to my true self and it has been quite a year! When it comes to inventing new methods or thinking outside of the box to find new solutions, I believe that those of us in the transgender community have an aptitude for problems requiring this type of thinking. I came out to my late mother in my mid-teens as trans. To my surprise she had already known this and, as she would tell me that day, she had suspected it for years but had waited for me to tell her in my own time. She surprised me further by pulling out a stack of information that she had been gathering to research and understand what was involved in becoming your true self, your true gender. I have definitely inherited from her my way of finding solutions to problematic issues. My current doctor calls the process faced by trans people in the 1970s barbaric, and he’s accurate in his assessment. The road was littered with roadblocks and gatekeepers with mostly what is now known as reparative or conversion therapy. Nowadays the trans process is much simpler and even though it still has many obstacles, the reparative aspect of it is mostly absent. In 2010, I was devastated to lose my mother, Joyce, to an aggressive form of brain cancer. Over all the years since I had come out to her, she had been my greatest support and cheerleader. After her death, the depression, panic and anxiety disorders that I had kept mostly under control became unmanageable. Add gender dysphoria to the mix and it all resulted in multiple major health crises over a short period of time. I ended up becoming homeless for two years. I also became a client of our city’s shelter system for homeless people. Having had to keep my trans status under wraps for many years came in useful, since the homophobia and transphobia encountered from residents and staff was truly appalling. When I was finally ‘outed’ as trans by another resident, it became unbearable. There were no solutions to be found in the facility where I was staying, so I requested and received a meeting with the organization’s executives. With the support of one of the mothers from the Toronto chapter of PFLAG (Parents, Families & Friends of Lesbians & Gays) we met with the executives, laying out in detail not only the issues, but the ways, means, and the people to involve in creating a safe environment. Fortunately, these changes were implemented, and I hope that now other trans people who have to use these shelters will find them safer places to stay than I did. I was so impressed by the work done by PFLAG and the shelter executives that I continue to work with them, helping to expand their reach and resources for the trans residents in our city. Recently, having heard from many transgender people how difficult and frustrating the process is to change your name and gender marker, I started looking for a better way to make this happen. There are many government forms involved, along with other documentation you must source and submit as well. It can be overwhelming. I am now working out the details for our first few clinics to show transgender people not only what process is involved, but also to help them complete their paperwork, so that their application is accepted when it is submitted for the first time. I am doing this with the help of the many contacts that I have made over the 30 plus years of activism and advocacy (in addition to my regular career in IT). I’m so grateful that people want to help – they just needed to be invited. The dates and locations of the clinics will be available by the spring of 2015. I also speak to the public about transgender rights and issues and about mental health concerns for trans people. From small to large audiences, I share my stories about surviving depression, anxiety, and gender dysphoria, along with the tales of my work behind the scenes over many years. 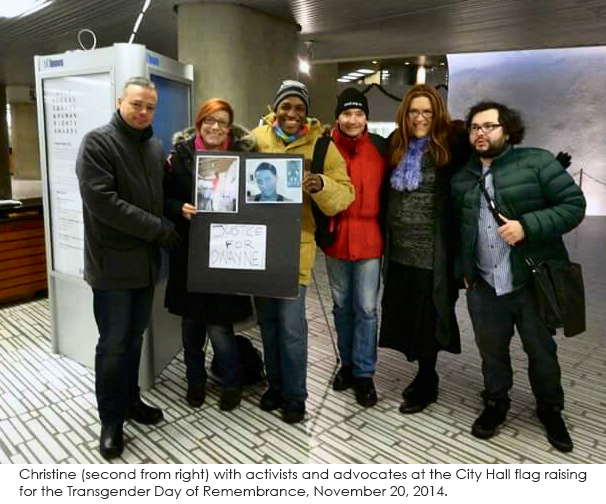 As well, I spend time with people who are interested in learning about transgender issues. During some one-to-one conversations over the past year I have been privileged to have three people come out to me as transgender and I was able to guide them to the appropriate resources and information so they could begin their own personal gender journeys. The past year has been jam-packed for me, and the coming year will be no different. In addition to going through my own transition and its various milestones and breakthroughs, I have been involved in many activities: I helped to launch the International Trans Chapter of The Pink Panthers Movement; I worked as an investigator for the Transgender Violence Tracking Project; I was one of the founding members of the Toronto Trans Alliance; I joined the advisory board of the Get It Right Campaign, and I have been available as a resource person for the outstanding people of PFLAG. My 2015 calendar is also filling up with various new initiatives and programs created by others who also think outside the box. I am collaborating on an article on trans people and mental health (based on my personal experiences), working with our city’s police service on a new training initiative, and facilitating a new group for middle-aged transgender women. And I will still find the time to enjoy the next year of my transition. My dear friend and professional make-up artist Stefan Peloza is already working on designs for my spring looks, and after having been sequestered from the world for half my life, I fully intend to enjoy as much time as possible with my girlfriend. I can be found on many social media platforms by my own name or as @HeyWriterGrrl. I particularly love the article by Christine Newman and I share it with all of my friends. There needs to be more exposure on this topic and she is a beatiful writer!